As long as we all understand that this is an opinion piece we're gonna be just fine. 1. A reasonably current camera body. This means something under 5 years old. Older digital slrs still work fine but the tech has moved so far you'll be happier with the better metering and autofocus systems introduced in the last few years. If your battery is more than 3 yrs old, you should think about a replacement. The question of crop sensor or full frame depends on you. If you want ultra wide angles, full frame serves best but for long telephoto work on small subjects, the reduced image circle of the crop sensor really helps. 2. A wide angle to short telephoto zoom. Today's kit lenses are pretty good but there are better options. Something in a 24-70 or 24-105 for full frame or 18-85 on a crop sensor will work. You'll be happiest with a fixed maximum aperture, so look for something between f/2.8 or f/4.0. Slower than that and you give up shallow depth of field and will need to push your ISO to handhold in low light. 3. A telephoto zoom. I like the 70-200 range because you can get good to very good maximum apertures, again in the range between f/2.8 or f/4.0. Don't go for too much reach because you'll sacrifice lens speed and reasonable handholding ability. Look for a lens with a tripod collar. You'll thank me later. 4. A TTL flash. Yup, a flash before more glass. Make sure it works fully with your camera's flash management program and buy the most power you can afford. At some point, often the same day you'll be buying modifiers that improve the quality of light but eat up power. It must have a head that can bounce and swivel at least 90 degrees. Each camera manufacturer has their own unique flash interface. This tends to lead buyers to the manufacturer's own flashes. Not ad but premium price. There are third party flashes that compete effectively and they're often less expensive. Ive been using Metz Mecablitz products for over 30 years and recommend them highly. 5. A macro lens. Look at something in the 100mm range to give decent stand off distance, but still reasonable lens speed. f/2.8 is fast enough, for really small subjects, you'll be on a tripod anyway. For Nikons, you cannot beat their 105/2.8 macro. Canons are best served by the 100/2.8 L series macro. There is a non-L version as well that is still very good. These focal lengths are not only great for macro workout are stellar for portraiture. I don't recommend macros of shorter focal lengths because to achieve 1:1 life size ratios, you will be right up to the subject and this can give you trouble with lighting. 6. A tele converter attached to the telephoto zoom. These things used to really degrade he image quality but the vendor matching ones are excellent. I recommend the 2x as the best all round choice. For Canon get the series III versions as they are much better than their predecessors. Nikon's TC-200 is excellent. 7. Select accessories. This is one of those places where things can get really out of hand, so I'm going to try to keep things short. Or sort of short. Gadget bag - zillions of choices, try to avoid building a collection. I'm a bad one to talk as I have many bags for different purposes. It's common to buy and sell bags as your use cases change. 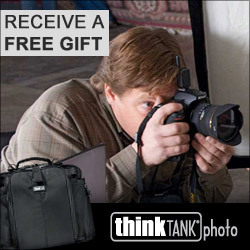 Great bags are available from LowePro, ThinkTank and Domke. Tripod - carbon fibre for preference with a ball head. A good tripod isn't cheap but a cheap tripod is a complete waste of your money. I recommend Manfrotto, Gitzo and ReallyRightStuff for legs and standardize on RRS ball heads. Filters. - Multicoated UV filters on each lens. Cheap filters ruin images. Also a polarizing filter if you do landscapes. I recommend B+W across the board. Heliopan are also superb, and the US manufactured Tiffen filters are typically very good. House brands are a prescription for failure. Flash diffuser - lots of options, the Gary Fong collapsible Lightdome is one option that works very well and is easy to use. Batteries - NiMH rechargeable batteries for the flash with a charger. Was elect batteries with output equal to or more than 2100ma. Lenspens - buy a few, they get lost easily. Memory cards - faster is better always and a well built card can survive a lot. A cheap card with the same specs as an expensive card is cutting corners somewhere, usually in the memory itself. That is the most important component since you have nothing without it. Avoid cards with less bandwidth than 60mb/s if you can and while it's good to have multiple cards, small cards are false economy. At the time of this writing, 16gb cards are the most cost effective buy. I've used Transcend in the past but have experienced slow bandwidth, high performance specs notwithstanding. So for now at least, I would stick with high performance Lexar or Sandisk cards. The Hoodman cards are the toughest on the market and use the best flash memory but are very pricey. You'll also want to process your images. Software often comes with the camera but it's most often limiting. Many computer operating systems include a basic photo editor such as the iPhoto application included with Apple's OS X. After trying many different tools I recommend Adobe Photoshop Lightroom. Lightroom runs on Windows and Macintosh, and not only edits, but has a superb cataloging system. Lightroom is an editor for photographers. You certainly do amazing things in Photoshop itself but PS is a designer's tool first whereas Lightroom is built for photographers. Adobe cut the price substantially with version 4 making the product much more accessible. Beyond your wide angle lies the realm of the ultra wide. This space really demands a full frame sensor. Rectilinear wides keep lines straight but show plenty of perspective exaggeration. Fisheye lenses allow straight lines to bend. They look cool but are costly and have limited use in general. I personally select the 14mm rectilinear on a full frame as one of my favorite lenses. If you need more reach you are into the realm of super telephotos. This is very expensive glass since its specialized demands also necessitate high lens speed with wider maximum apertures. Unless you are generating a lot of revenue, you may be better off renting. If you are going to shoot pro sports or do serious bird work, this range starts at 400mm with 600mm lenses being favoured. They cost like a decent used car though. Tilt shift lenses allow you to manipulate the plane of focus, most often used to correct architectural images that are leaning or look like they are falling over. They're expensive and today's post processing software can do a lot of corrective work, formerly the province of tilt shift lenses. Some landscape photographers really like the tilt shift lens to control the scene. Well known and widely respected photographer Moose Peterson uses the tilt shift in this way. There's a lot of noise about fast primes these days. Back when film ruled most SLR cameras came with a 50mm lens with maximum aperture of f/2.0 or slightly wider. Now vendors call these "portrait" lenses. This is true on a crop sensor because of the reduced image circle, but on a full frame it's a bit wide. If you really feel the need to get a fast prime, save your money until you can afford a lens with a maximum aperture of f/1.4. My favorite 50/1.4 is by Zeiss but it is really expensive and is manual focus only. If someone tells you that photography is an inexpensive hobby, they may have a mental illness or a serious addiction to hallucinogens. It is an expensive hobby. It's also the only way I know to freeze time and tell a story in a single image. Gear is great but getting out and shooting is the most important thing.